The “Crown Princess Project – The Resurrection of the Royal Family” is a comedy saguek (historical drama) that tells the story of the various tests that girls have to go through during the selection process for the crown princess by the royal family in Joseon Dynasty era. It’s said to be the idol variety version of MBC’s The Moon that Embraces the Sunn, raising expectations. It’s reported that 12 female idol actresses will be starring in the show, including IU, T-ara’s Soyeom, T-ara’s Boram, miss A’s Min, and 4minute’s Sohyun. However, the identify of male actor who will be receiving the courtship of 12 women is yet to be revealed. The Lunar New Year special program, “Crown Princess Project – The Resurrection of the Royal Family” will be broadcast at 7:20 pm on the afternoon of January 23rd, 2012. 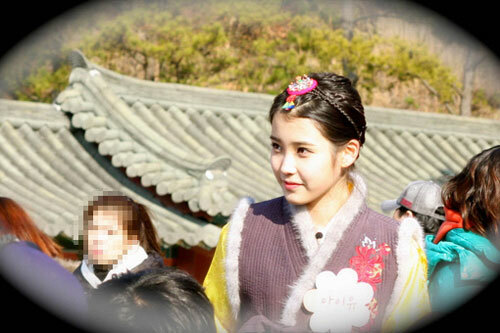 IU is spotted wearing hanbok.